If you own a Bad Axe saw, and you don't want to sharpen it yourself (or you tried, and goofed)--just send it back to Bad Axe, and we'll tune up that toothline for the princely sum of $15.00. And oh, by the way--if you have purchased a saw filed hybrid-cut from Bad Axe in the past, and you wish to buy another Bad Axe for a dedicated filing, I'll re-file your hybrid-filing to either dedicated rip or crosscut free of charge. Have you ever wondered about tooth geometry, and how saws from one maker differ from another? Or perhaps participated on an online forum in which one person posits 'this is THE answer for sawfiling tooth geometry,' and anything that differs from their humble opinion is crap? LOL. . . . Don't read too deeply into those kind of responses. Just take your saw and sever wood fiber with it in the pursuit of constructing something beautiful. I mean, here's the deal: anyone who makes saws in this business has their way of filing saws, and it's not just about tooth geometry--effective sawfiling also has to do with pitch, the gauge of plate, the handle's hang angle, and the kind of wood species and dimension the customer wants to cut. At the end of the day, your saw simply needs to be well jointed, set and sharpened. The basics are truly about 90% of the equation. So the purpose of this article is to explain how Bad Axe files your saw, and how you can use this knowledge to keep the edge on your teeth freshened up from time to time. The key thing to remember is the following angles and techniques are what works for us and the customers we serve, based on time-proven techniques that work. 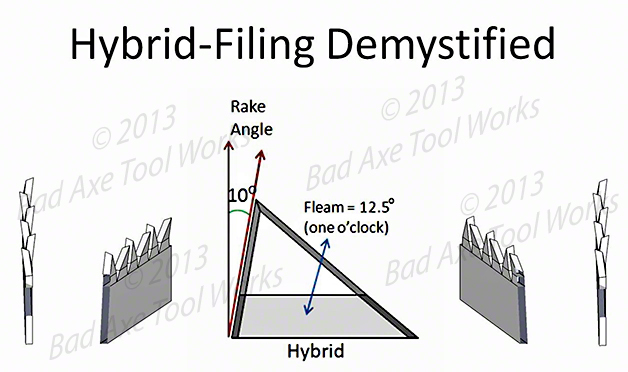 Let's demystify hybrid-filing for starters: Simply put, hybrid-filing can be looked at as either A relaxed rip with bevel, or an aggressive x-cut with less bevel. The diagram on the right reflects the angles we use when customers order hybrid-cut. Rake angle: Our hybrid rake is generally 3-5 degrees more relaxed than a typical rip rake, so 10 degrees rake work the best for our saws. You can replicate that angle on a Bad Axe saw by resting the first inch of your file in the gullet and wiggling it until you find the angle that's already there. 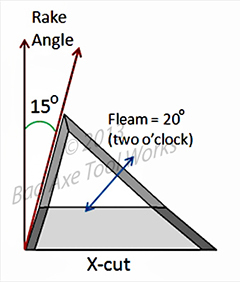 Fleam angle (aka bevel): Now look at the fleam angle (aka bevel), which we establish at 12.5 degrees--a more aggressive angle than the 15-20 degree range for most crosscuts. But you'd be surprised how 12.5 degrees again hits that sweet spot for effective cross-cutting. Because we stone our toothline during the finish sharpening process, we create a micro-facet on the tip of the tooth's cutting edge, which goes a long way in making your crosscuts quite smoothly finished..
Now that I have scientificaly explained the angles behind hybrid-filing, and it's something you want to try, let me share something with you that should deflate the godawful complexity of it all: just rest your file laterally in gullet at about the one-o'clock position. Wiggle it back and forth and look at the toothline from the side, and you'll find the preestablished rake at the same time :) See? You've attained roughly 12.5 degrees bevel and 10 degrees rake through common sense, like lining up a pool cue . . . and if you gank it all up, no one's going to take you out back and beat you up if you vary a few degrees either way. As long as you're not shortening teeth out of joint during the sharpening process, you'll be just fine. So is hybrid-cut THE saw-filing panacea? Heck, no. Nothing beats dedicated rip for tenon cheek ripping, or dedicated x-cut for tenon shoulders and carcase work. But--if you're new to hand tools and on a budget, a hybrid-filing will keep you from having to buy two saws up front. And, you'll be quite surprised at how effectively this filing rips, and how clean a finish the filing offers when used in x-cut mode. On the other hand, if you're pretty far down the slippery slope of buying and using non-corded saws, and have purchased simply too many saws for any one spouse to put with (and are now confronted with the need to SIMPLIFY your nest o' saws), then that's where hybrid-cut can also come in quite handy as you 'choose' to adopt a minimalist approach to severing wood fiber. And oh, by the way--if you have purchased a saw filed hybrid-cut from Bad Axe in the past, and you wish to buy another Bad Axe for a dedicated filing, I'll re-file your hybrid-filing to either dedicated rip or crosscut free of charge. Mmm, yes. . . (any Kate Bush fans out there?). This profile & geometry is what we put on our dedicated ripping saws, like the Roubo Beastmaster, or really, any saw that the customer wants to use in dedicated rip mode. Don't agonize too much whether it's appropraite for a carcase, sash, or tenon saw. 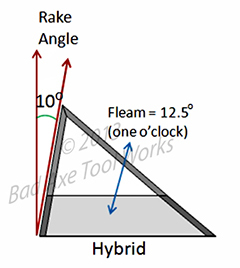 Rake: The rule of thumb here is that you can get away with a more aggressive rake for utility in softwood, and more on the relaxed side for hardwoods. 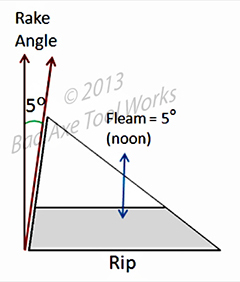 Fleam/Bevel: A little bevel for rip filing is a good thing--it reduces tearout on the far side of the cut. 5 degrees is about right. Just eyeball your file laterally at high noon--12:30, to be precise with your five degrees, and you're good to go. This profile & geometry is what we put on our dedicated x-cut saws, like any of our carcase or miter saws. That said, again, don't agonize too much whether it's appropriate for a carcase, sash, or tenon saw. What matters is how long a x-cut you intend to make. Rake: You'd be surprised how little rake is actually necessary to carry through a good x-cut. A more relaxed rake in the neighborhood of 15 degrees generally works out best for Bad Axe saws (and for that matter, most vintage saws since we base our designs on historic American saws from the late 1800's. Think of rake as the throttle for the kind of action you want. Cutting western softwoods? Creep toward 10-12 degrees. Want to make delicate cuts on fully seasoned hardwoods? Best keep it around 15-17 degree range. Fleam/Bevel:The rule of thumb here is that we file more fleam for softwood utility, and less (down to 15-17.5 degrees for hardwood utility. Rule of thumb here is the harder the wood, the easier it will blunt the keener knife-edge of a 20-25 degree bevel. The more aggressive, chisel-like edge of 15-17 degrees works quite smoothly for most hardwoods. In closing, sizing a saw and choosing how to file it is a lot like sizing a hand plane, and determining how to sharpen the bevel. Think of the length of your toothline, and how big of a cut you want to make. There is a continuum of size and intent at work here: the smaller the saw, the thinner the plate, the finer the teeth, the more delicate the work. Likewise, the larger the saw, the thicker the plate, the coarser the teeth, and the more robust the cut.